This pack contains six, hour-long lesson plans designed to appeal to children aged 8-11 years old. There are many ways of using the IYP theme to enhance the school curriculum and these resources contain information, facts and figures together with ideas and activities that will bring issues such as health and nutrition, food security and environmental sustainability into your classroom. The plans are designed to either build concurrently or work as stand-alone classroom activities. The aim is to inspire young people – not only to think about the role of pulses (grain legumes) in feeding the world, but to motivate them into playing a more active role in matters affecting their environment. We hope that your students enjoy the activities in this pack. To introduce the idea of pulses (grain legumes) as edible parts of a plant. Students will identify and recognise the different parts of plants that are edible. Students will collaboratively create a class display, characterising plant crops through nutritional value. 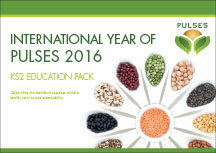 Students will consider the importance of the UN promotion of pulses. (a) Diagram of the edible parts of plants (b) Plant part labels and examples for each (all from the teacher pack). (a) Set A & B: Blank flash-cards, (b) Details of nutritional facts of a variety of foods derived from plants (all from the teacher pack). The class display can be continued as an ongoing project with pupils adding more detail as the series of lessons continues. Pupils could find or make extra resources at home for any of the edible plants they have discussed in class, or any others that they may be interested in, to stick to the display. To introduce the role of pulses in relation to maintaining a balanced diet. Students will recognise the role different foods play in a balanced diet, and the effects on health of an unbalanced diet. Students will explore ways in which we can design balanced meals from different food types. 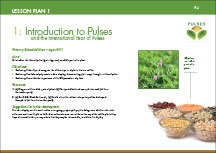 Students will evaluate the benefits of including pulses in a balanced diet. Diagram of a balanced diet (from teacher pack). Diagram of an unbalanced diet without fruit and vegetables (from teacher pack). 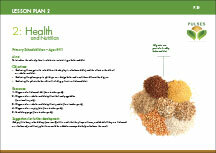 Diagram of an unbalanced diet without protein (from teacher pack). Diagram of an empty plate (from teacher pack). Food diary page (from teacher pack). Ask pupils to keep a food diary (resource 5) of the meals that they have at home, and decide if they are balanced or unbalanced, and if not, what items could be added or removed to help re-balance the meal. To prepare a nutritionally balanced meal / snack with pulses. Students will plan the steps required to create a pulse-based meal or snack. Students will prepare, and eat a pulse-based meal or snack. Students will promote the benefits (nutritional or otherwise) of their chosen meal. Risk assessment (from teacher pack) – cooking with students. A selection of recipe cards (from teacher pack). Cookery planning sheet (from teacher pack). Take home sheets (from teacher pack). The lesson provides a perfect opportunity for students to take home the message of the role pulses can play in a healthy diet. Along with the recipe cards, the ‘take home sheet’ in the resource pack will allow families to engage in discussion about how they can incorporate pulses into their diet at home. Students could be encouraged to cook for their families at home and share a pulse based meal. Alternative recipes can be found at www.pulses.org. Consider selecting a recipe that uses a pulse ingredient grown locally so that the farmer’s story can be discussed in class. Get the students to ‘plate up’ and take pictures of their food, with the best being submitted to the School Newsletter (including the recipe) to promote healthy eating. Regular cookery lessons could be built into the curriculum using pulses and other foods to promote the idea of healthy eating. Class to visit a local supermarket to look for / buy products that have pulses in their ingredients. Followed up by a classroom taste-test. To introduce agriculture as a managed system that has environmental impacts, and how farmers employ practices such as growing pulses to minimize these impacts. Students will understand how nutrients are passed from the soil to the plant through its root system. Students will understand nitrogen-fixing as a concept. Students will learn about symbiosis through the role of rhizobia in growing pulses. Instructions for growing pulse plants in a can, with lead questions (from teacher pack). Diagram of nitrogen-fixation with rhizobia (from teacher pack). Example of crop rotation (from teacher pack). Crop cards 1 to 5 (from teacher pack). Visit a local farm or invite a farmer to speak in class. Pupils could record how their plants grow over a period of time – making observations recorded as diagrams/graphs etc. Pupils could grow alternative pulse plants such as chickpeas and navy beans and compare rates of growth. living in symbiosis with rhizobia, or even planting different crops together. Pupils could research (at www.iyop.net) the impact that pulses in crop rotation have on sustainability. To explore cultural contexts of pulses throughout history and in modern times. Students will compare diets around the world and throughout history. Students will develop their understanding of how different pulses are used in different dishes around the world. Students will consider how different countries / cultures use pulses to meet their dietary needs and the role global trade plays in that process. World map (from teacher pack). Diets through the ages fact sheet (from teacher pack). Modern diets fact sheet (from teacher pack). National dishes that use pulses fact sheet (from teacher pack). Pulse import and export data fact sheet (from teacher pack). Research how your own country uses pulses. Do they play a major part in your diet? Does your country grow more or less pulses than it needs? How does the trade in pulses affect your country? For further reading: Hungry Planet, What The World Eats by Peter Menzel. To enable students to consider the availability of food resources, and how pulses can improve food security for communities. Students will recognise that the availability of food varies across the world. Students will develop an understanding of the UN WFP school feeding programme and discuss and evaluate the benefits of such a programme for hungry children. Students will consider the role of pulses in improving the food security of a community. UN WFP fact sheet (from teacher pack). Template of box with UN WFP logo on it (from teacher pack). UN WFP food basket (from teacher pack). Students to consider if there are food security issues in their own communities. A whole school or class initiative could be introduced with pupils asked to make and fill boxes at home with foods that meet the UN WFP food basket criteria. These could then be distributed to poverty stricken groups either by the school or local charity.